Friday update: speak, advancement leaders! Here are some great stories about how fundraisers are doing — and thinking about, their jobs. Many higher ed institutions across the globe are boosting their social budgets to keep up with a new generation of students who rely primarily on social media for their news and information about a variety of topics, according to a new report from Hootsuite, a social media monitoring company. “Stretched too thin” was how I would have answered the question “How is work?” when I was a fundraiser. Rarely did I ever feel that I was truly on top of my portfolio, knowing who I should focus on today, who just made their gift, and who I needed to see two months from now. That’s the advice Dyan Sublett, president of the MLK Community Health Foundation, gives to fundraising colleagues. Being crazy, she explains, means taking career risks. What is the real future of fundraising? How can colleges and universities meet the current challenges and future opportunities to increase participation, retain donors, and raise more money—all while increasing productivity, efficiency, and return on investment? 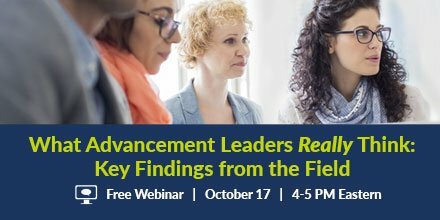 Join us for this free webinar on Tuesday, October 17 todiscover the top goals for today’s advancement leaders and the best strategies for reaching them.